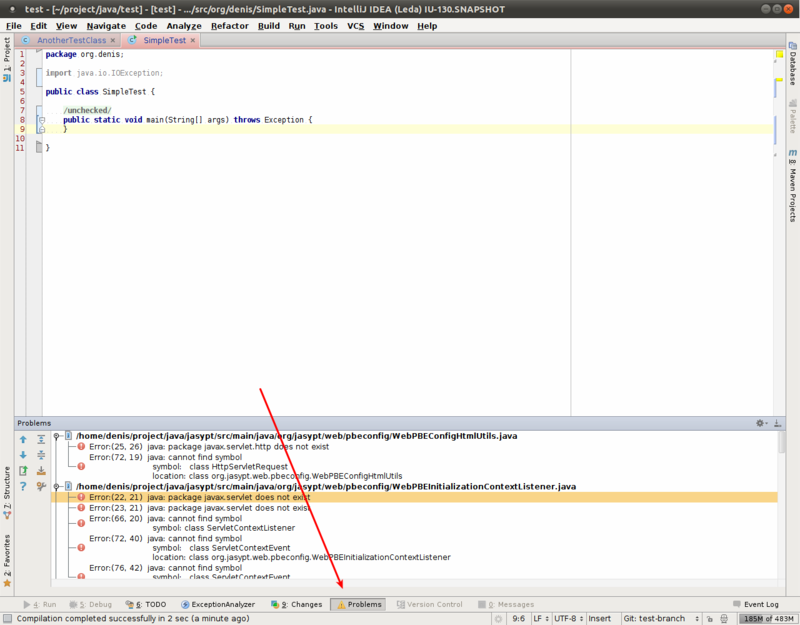 In Eclipse, when I make any code changes it automatically shows all compilation errors in the workspace in a console. Is there something similar in IntelliJ? It seems in IntelliJ I have to make/build the project in order to see any compilation errors. Is there a window/tab to show all compilation errors automatically as you make changes to the code? I tried the setting but it doesn't seem to work. I tested it by removing a parameter from a method, and expected to see an error for the caller of the method but I didn't see anything in the problem console. Is the error supposed to show up automatically? Yes, errors appear there automatically but with a delay, e.g. when you make an error, it's highlighted by red at the editor and only after couple of seconds appears at the problems view. Thanks! Yeah the delay for me took awhile but eventually it showed up.